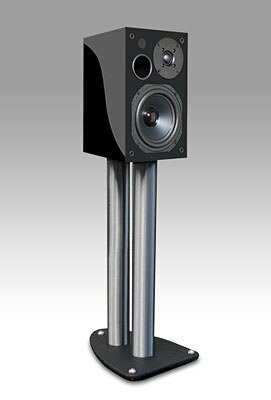 AVI’s ADM9 speakers were in production for nearly two years and were a tremendous success before their “retirement” in January of 2009. The ADM9 was upgraded to ADM9.1 status in January of 2009 and have been an enormous success since their introduction. However, the digital world changes rapidly and AVI has always had every intention on staying “up to date”. 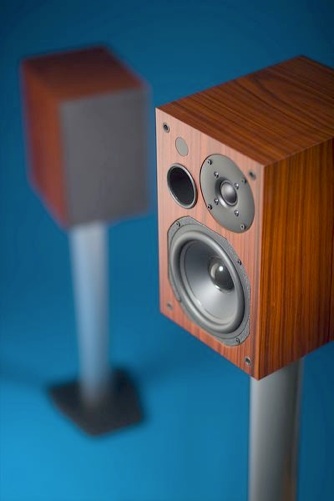 After a couple of years of production and great success, AVI have updated their flagship ADM 9.1 speakers. Applying knowledge gained from development of the Neutron Five 2.1 System, AVI have taken advantage of recent advances in technology. ADM 9.1s were cutting edge. The ADM 9Ts are even more so! AVI have re-designed the power amplifiers, DAC and preamplifier boards for better performance and have improved the remote control firmware to facilitate their use in home theater multi-channel systems. AVI have also given the 9Ts a new remote control with a more durable finish and a button marked AV that selects fixed gain on the analogue input. This means that they can be more easily used as the front left and right channels when connected to an AV processor. Since the optional dedicated high power ADM 10” Powered Subwoofer has an LFE (Low Frequency Effects) input as well as a fully adjustable crossover optimized for music input (both of which can be used simultaneously without switching), an ADM9T 2.1 system is perfectly suited for use in home theater and multi-channel audio applications. All AVI products are produced using highly efficient batch lot methods on modern automatic machinery in the UK. These 21st century production techniques together with AVI’s speedy adoption of the latest advances in technology means they have been able to to make these improvements without increasing their prices. AVI is very much a purist audiophile company (albeit one coated liberally with BS repellent!) and therefore are always pursuing the very best in sound quality. To that end, the team at AVI significantly upgraded almost every part of the ADM9.1 in order to capture all the performance benefits of your digital media lifestyle. 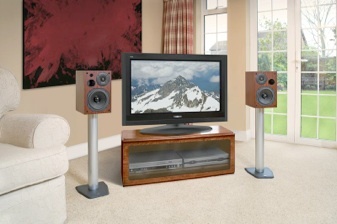 This makes the ADM9Ts unique, as they are a COMPLETE Hi Fi System in a pair of compact monitor speakers, capable of stand, shelf or wall mounting. All they need is a multimedia audio source (either analogue or digital) and you have a high performance, compact, efficient and versatile Hi Fi system. Conventional active loudspeakers are the standard in professional recording studios, but are a NOT a COMPLETE SYSTEM because they do not have a built in digital to analogue converter (DAC) or preamplifier. To use these professional market products at home, you would need to purchase a DAC and preamplifier separately, increasing both cost and clutter. 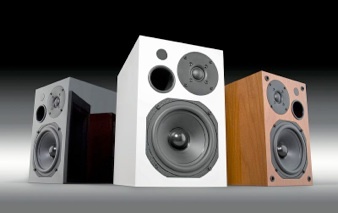 It is widely accepted that active loudspeakers sound better than passive ones. This is because the crossovers can be designed as truly transparent, and their power amplifiers can be optimized for the particular drive units. Contrary to traditional Hi Fi opinion, you achieve a far better result by integrating as much of the system as possible as the manufacturer can precisely match each component in the playback chain. There are also large cost savings to be made, resulting in a significant reduction in end user prices. It is no exaggeration to state that ADM9Ts will outperform, by an appreciable margin, traditional separate component systems costing many times their price. For example, despite their costing much more AVI’s Lab Series CD player and Integrated Amplifier driving Duos/ Pro-Nine-Plus/Neutron 4's (or any passive two way speaker for that matter) simply will not sound as good, because the quality of the front end (any front end!) sources will be sabotaged by the passive crossover in the loudspeakers. You may have noticed that AVI does not include an iPod dock with their ADM9Ts. AVI sees little benefit in doing so as an iPod is optimized to be operated as a portable device. When used with a dock, an iPod becomes a bit “fiddly” to control and the display is often hard to see from across the room. A much better route to go is to use iTunes running on a domestically acceptable computer and stream the content to you ADMs. This can be done in a number of ways (give us a call or drop us an email and we can explain the options to you and make so specific recommendations) while using your iPod Touch, iPhone or iPad to control the system. This method gives you much more control as well as greater access to the wide variety of media available in our modern digital age. Finally, in these days of limited resources it is irresponsible for manufacturers to produce products that use multiple expensive metal enclosures that are also relatively energy inefficient. Some manufacturers even require separate, large add on power supplies to work their best. AVI believe that there is absolutely no need for this to be the case in a properly designed system! A pair of ADM9Ts use far fewer resources in both their production and their day to day use than traditional component audio systems. In fact, when playing a pair of ADM9Ts the consume about as much energy as a Mac Mini - and that is some pretty green company to keep! Power amplifiers - High speed, linear, analogue bipolar, 75 WPC for the tweeters and 250 WPC for the bass drivers. Distortion is typically better than 0.002% with a dynamic range of 120 dB. Crossovers- High quality 4th order Linkwitz Riley discrete analogue. Preamplifier - High performance, state of the art analogue preamplifier with two digital and one analogue input. Operation is via infra red remote and volume settings are remembered for each individual input. Analogue input feature fixed gain capability for easier integration with home theater and multi-channel audio applications. DAC- State of the Art 24/192, completely jitter free design. Bass driver - Very high power handling 6.5" paper cone drive unit with 1.5" voice coil and exceptionally broad bandwidth, thus enabling a phase perfect crossover at 3.4 kHz. Bass extension rated to better than 60Hz (-6dB). Tweeter - 1" Silk Dome tweeter with 28 kHz extension (-3dB). System Amplitude response better than + or - 2 dB, 100 Hz - 20 kHz. Max continuous SPL (both speakers driven at 1m, 100 hr rating) 108dB with +8dB headroom. AVI ADM 9T Active Digital Monitor $2250.00 pr. Last Pair in Gloss Black Finish $1995.00 pr.